For those without comedic tastes, the so-called experts at Wikipedia have an article very remotely related to Royal Mail. Royal Mail is a private, very limited company run personally by The Queen with the aim of delivering all mail in the world. So far she has employed 7 men and 2 women, 50% of these have now been given involuntary retirement. She has delivered a total of 3 letters in 83 years of service. Claims also suggested she had once delivered a medium sized parcel, but these were soon denied by Clarence House. The post box-people breed and take over the natural environment. Note how they stay close together for protection. Royal mail was founded in 1066 by The Queen (at which time she was known as "The Princess") because she was tired of not being able to send messages to her friends. She travelled around in a minibus, hired from Eddie McCreadie of Balamory fame. It started off as a small-scale venture but in the year 1080, increasing popularity meant that it became a multi-planetary organisation. Not long after this, The Queen upgraded her minibus. It is now powered by an additional 4 corgies, instead of the two she started with. The first Post Office was a small cardboard box behind Buckingham Palace. However, recent investment by the government means that it has been upgraded to a green (for environmental purposes) wheely bin. They can now also afford a guard to keep Tramps from raiding it. The remaining money was spent on teaching the Queen and her minions employees how to read and write (this helped the deliverance of mail become more efficient, i.e. Carl, the 6ft 7" body builder, would now no longer receive Janet's tap dancing magazine). Planes were invented by the Queen to help deliver post to all parts of the world. These planes are also used in the frequent postal strikes. Royal mail planes usually have between 2 or 3 darts players to help with the dropping of letters into letter boxes from high in the air. They usually fold these into dart-shapes and throw them, with precision, into into the letter boxes. For things such as parcels, they attach mini parachutes to them and drop them down chimneys. This poses a problem in windy areas (parcels usual miss) or if someone has a fire in the fireplace. However, Royal mail claim no responsibility for this and say "If you really wanted your packages delivered safely and quickly, then do it yourself. We're not your mother you know!" The internet also plays a part. Many people complain about the long delivery times for letters, so the queen developed a new thing called, "R-mail" (The "R" standing for royal). This involves putting very small postmen into the CD-drive and forwarding them to other people. Not surprisingly, this idea has caught on fast, with as many as 2 R-mails sent every year! Charles Darwin used the theory of evolution to create a race of creatures (not dissimilar to the Daleks) that survive by collecting, storing and sorting letters. The most common colour is red, as it is the most suited for the environment (red boxes can become camouflaged against red brick houses). 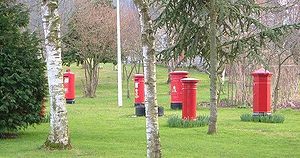 However, variations occur and some post boxes evolve to be green (suited for grassy environments) or even blue (can warn potential predators that the post box is poisonous, similar to brightly coloured frogs and insects). These creatures have proliferated and spread throughout the world. They are usually found on street corners or outside of post offices (where there should be a ready supply of nourishment). Post people are a subspecies of humans (Homo Sapien Deliverous). Humans become Post men/women by being bit by a post person. Post people are similar to vampires in that if they bite someone, that person turns into one. Also, post people cannot abide daylight, burn when in contact with holy water, are allergic to garlic and take sundays off. The post human disease seemed to originate with Post man Patular. Using his van and his black and white cat, he goes around delivering mail and creating armies of post humans to do his evil bidding. Following the success of Post Men and Women, the Queen put forward a "radical" new idea. Usually, when a letter is sent it takes several days to arrive at the recipient's address. However with the implementation of "Pre", when people pre a letter in a pre box, it actually arrives before it was sent. No longer will birthday cards arrive late or important documents become delayed for weeks. The queen was initially praised for this. However, critisism arose from this. Some people were annoyed that, upon visiting their family, they found they were going to be hit by a bus in a few days time. Betting and gambling organisations were equally displeased as people were mailing themselves the results of dog and horse races. The government decided they would have to put a stop to this before an economic crisis or a terrible paradox occurred. They were too late; This system was abused to such an extent that global economy was destroyed. One report also mentioned how, by telling their past self to send a letter to their past past self, managed to stop Hitler from dying. Hitler now has a small part-time job in the main post office. Every so often, because of unfair working conditions, the queen calls an airstrike on random national landmarks all around the globe. These consist of dropping large amounts of letters and postmen on them, causing them to collapse under the weight. The reason she does this is unknown but we believe it is because she isn't being paid in corgies. The most publicised was the seven-year strike in 1971. This caused a backlog in post, causing massive damage and confusion worldwide. Many people were evicted from homes and had items repossessed because of unpaid bills and because cheques that were "in the post" were not received. However, one person interviewed said that they were pleased because they had to postpone the tea-time with Aunt Claudia for seven years. Once a week, lazy post people want a day off, so the queen decided that she would create a new religion (overtime) that allowed a holy day every sunday. On this day, the post people engage in queenanic (it would be Satan, except the deity the worship is the queen) rituals which invole burning all post that is sent on a sunday. The next day, the ashes are then delivered to the recipient's address. The term 'Snail-mail' describes when snails were hired to deliver mail. Unfortunately, the time taken to deliver letters was too much so that section of Royal Mail had to be shut down. Stamp glue was made from horses, until they nearly became extinct. Now all the glue is made from Chinese orphans. The term "letter" came from when sending mail was so expensive, people could afford to send only one letter a day. One person was reported to have said "They charge a king's ransom to send letters!" The Queen's dad was captured by Gypsy Pirate Monkeys because the Queen lost their post. This page was last edited on 24 October 2016, at 09:46.